I was so happy to see you pop up in my Blogger feed! Welcome back. I look forward to additional posts. So good to see you posting again! Wow, I love your display of little quilts in your entryway! Your Stars in the Garden looks wonderful! Maybe I will finish mine one day, but I used 1/2" hexies. I think it will be too large to frame and hang anywhere in my home. Thank you Janet. I'm happy to be back! Welcome back - lovely post and I'm happy to see you in my feed. I'm on IG so I'll see you there too. Thank you Barb. See you here and on IG! Yes - so glad you have returned!! Your blog is eye candy for the quilting soul - so many lovelies!! Retired you say...bet you are all ready wondering how you got things done when working...but guess what? Being retired means the days seem to be fuller than ever. 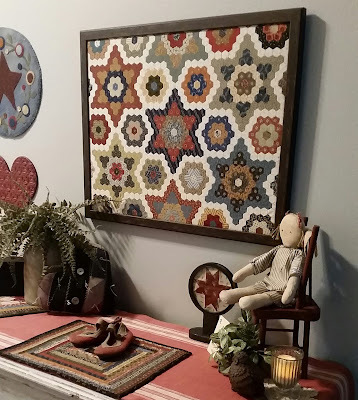 Love all the colors you work with and oh my those hexies are fabulous. Thank you for your kind words Pat. And you are right about retirement... I'm busier than ever, but wouildn't have it any other way! Ditto all the above comments! So glad to see you back.